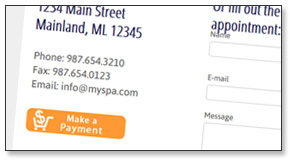 Easily add a button to the contact page or pricing page of your website where you can direct clients to pay for services either before or after a scheduled appointment. 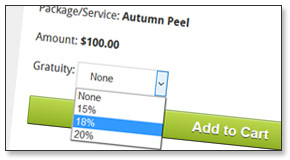 They can enter a specific dollar amount or pick from one of your services/packages. 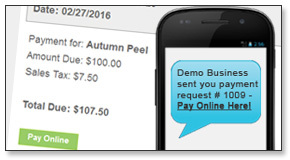 Easily create custom Payment Requests (like a digital invoice) that you can quickly send via text message or email to a client so they can pay online for services or for whatever reason. All with simple to use tracking of outstanding and paid requests. 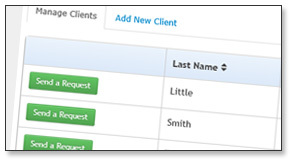 Save client contact info so that you can quickly create new Payment Requests without re-typing client's name, email, or phone. Perfect for frequent or recurring payment requests. Depending on what you are collecting payment for and your state/country tax laws you made need to collect sales tax. You can enable sales tax on your custom service/packages and on Payment Requests..
Don't miss out on that extra tip just because your client is paying online. 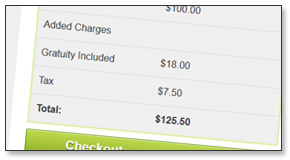 You can enable our gratuity option to be added to both dollar amount and service/package payments. With just a quick glance you can see all your unpaid or open requests. 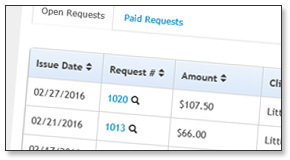 Paid requests are automatically marked as paid and easy reporting tools allow you to see totalls collected by date range or by client name. 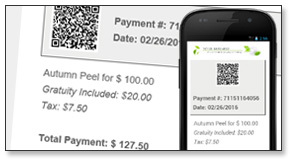 Online payments generate a trackable order in your account with printable receipts that are automatically emailed or texted to the client and merchant. 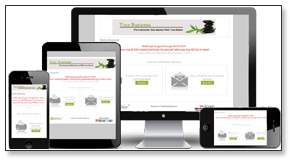 By using Responsive Design we provide your clients with an optimal viewing experience across a wide range of devices. Your clients can make payments with ease from mobile phones, to tablets, to desktop computers.